It is quite hard to comprehend the extraordinary detail of the Orientalist Rudolf Weisse’s painting, The Palace Guard (above). 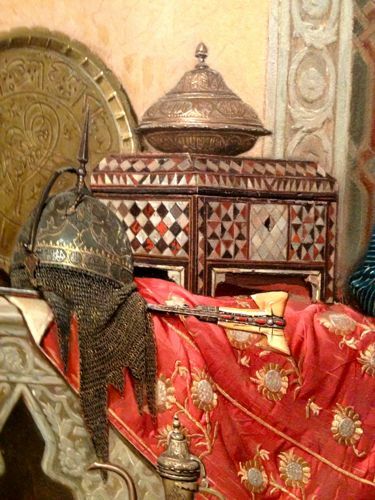 The length of the Qajar helmet that sits on an embroidered cloth in the picture is about 10 cm, from the tip of its spike to the bottom edge of the chain mail draping down. But the links and layers of the mail are so precisely painted – with the etchings and reflection on the helmet itself in such fine photographic detail – that you imagine Weisse’s brush with barely one or two hairs. The same is true for the copper etching on the Turkish aiguière, or spouted water pitcher, in the 46 by 31 cm painting, and the marquetry of the guéridon table it sits on. There’s little in the Sotheby’s catalogue to say where Weisse, a Czech artist who died in 1930, found his Ottoman subject and his furnishings. But the picture’s quality was reflected in the Sotheby’s Orientalist sale in London this week, when it sold for £145,500 including buyer’s premium, over twice its estimate. It was a standout piece in the sale, which collected a total of £4,825,9000, but in which the two of the priciest works, a Cairo bazaar scene by David Roberts, and a giant three-metre-square canvas by Ludwig Deutsch, failed to sell. The Deutsch, The Procession of the Mahmal through the Streets of Cairo (above), was the sale’s cover lot, estimated at £1–1,500,000. Deutsch is much better known as a painter of Weisse’s precision and scale, with works that are typically just a couple of feet across, like a work that sold for just over £2 million last year. But in the early 20th century Deutsch turned impressionistic and the epic canvas was thought to be his biggest ever. You’d also need a palace, or a museum, to hang it. On the Turkish front a panorama of Istanbul by the Italian artist Carlo Bossoli sold for £314,500 (above). 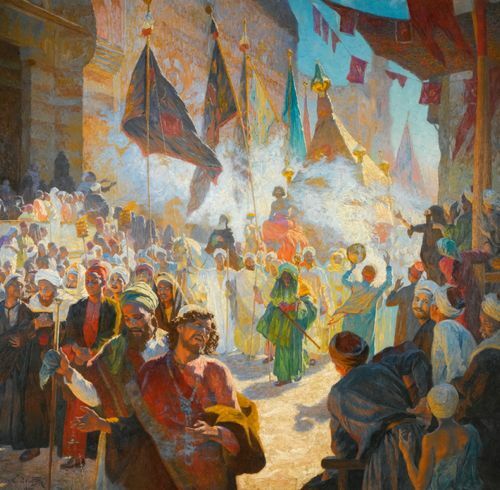 The auctioneer says there was both ‘Turkish and internationalist’ interest in the painting but can’t reveal whether it has joined the stream of major Orientalist works heading for the Gulf states, or perhaps found a Turkish buyer. The other lingering puzzle about the painting is exactly which palace it shows. In tempura on linen, by an artist who travelled in both the Crimea and Turkey, the painting has a clean architectural look to it, in bright bleached whites and blues. Sotheby’s Adrian Biddell described it as ‘fine and rare, almost unique’. According to the auction catalogue, it was painted in Turin in 1847 and shows the Dolmabahçe Palace, with Topkapı beyond, and other landmarks. This entry was drawn from the list of Bossoli’s artworks in the painter’s catalogue raisonné. As soon as the printed catalogue was issued, however, Sotheby’s got a call to say the work showed the Çırağan Palace, and changed the description in the auction room and online. 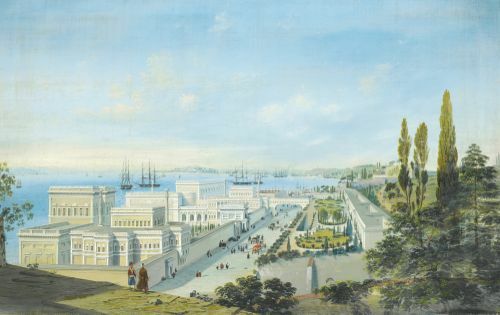 While the painting definitely bears little resemblance to the Dolmabahçe, it doesn’t look much like the Çırağan either. There’s a simple reason: in 1910 a great fire wrecked the Çırağan, now the Kempinski hotel, leaving only the outer walls intact. So the work is either a historically important record or a guessing game, and the new owner will have to correct a lingering puzzle about the dates. If it’s the Çırağan, a Balyan building constructed between 1863 and 1867, the listed date for the picture is also wrong (the Dolmabahçe, by contrast, was built between 1844 and 1856). 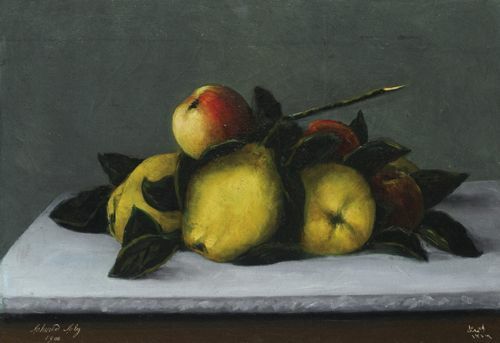 Utterly unlike the overtly Orientalist flavour of every other painting in the sale, was a Still Life with Fruit (above) by the Turkish artist, Ahmet Ali, also known as Şeker Ahmet Pasha. Born in Üsküdar and trained as a medic and a soldier, he was sponsored to go to Paris to train with Gustave Boulanger, who also taught Osman Hamdi Bey. When he returned to Istanbul in 1871 he earned high rank in the Ottoman court and was instrumental in acquiring many artworks from France. The picture sold for £122,500, respectably between its low and high estimates.